On to our last posting for our fab sponsors. This is it, the end of 2015. We'd like to thank our great sponsors with a hip hip hurrah. 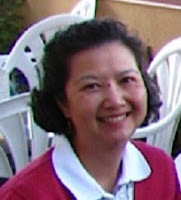 Arlene wants to thank everyone who follows our blog. Since we all put our own spin on thank you, I'm doing it with a cup of cocoa, not forgetting the marshmallow, please! Michelle is thinking about a New Year's Eve party! You can visit Michelle at Just A Nutter Paper Crafter for more information. My Favorite Things stitched rectangle (But the Memory Box Pinpoint Dies would work as well), Cricut sentiment (Simply Charmed,Plantin Schoolbook for exclamation point). If you don't have a Cricut, they have 4 companies that make a "Cheers"die, like this one from Cheery Lynn. Thank you to all and a Happy last day of 2015. Hope you all had a very good Christmas and got to spend time with your families. I'm here to share the card I made earlier this month for the Coffee Lovers blog. 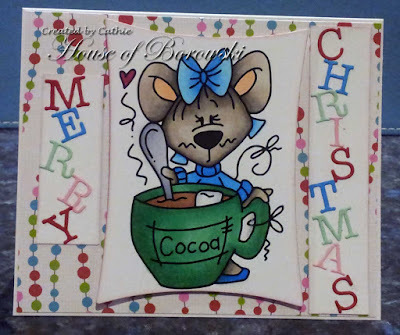 I used this adorable teddy and cocoa mug from our sponsor - Bugaboo. 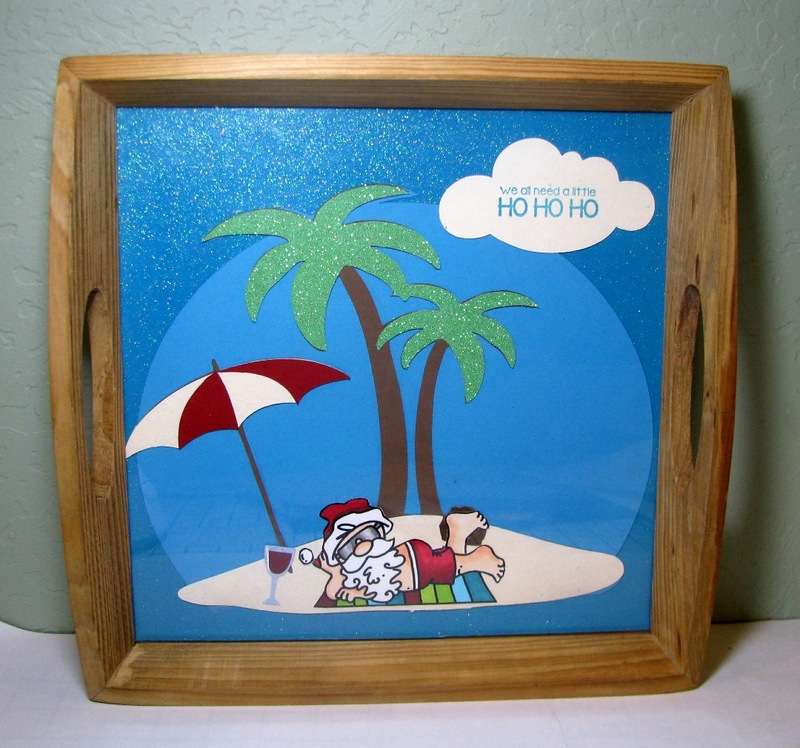 I used some Spellbinders dies to frame the image. 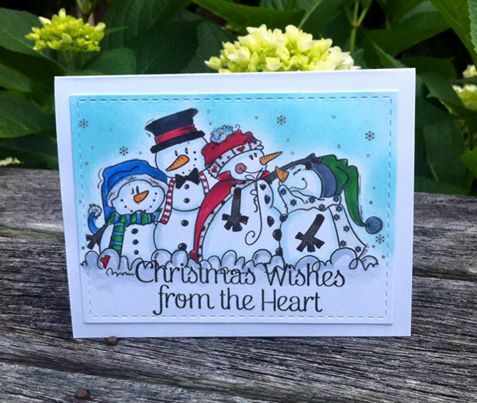 The little sentiment is from Penny Black. On these cards, I kept to dies as I was trying to finish a few more cards as I gave out a total of 77 cards on the 23rd. 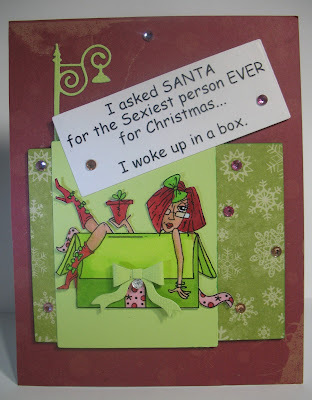 I just love this gift card holder. I am so glad I got this on sale for 35% off. 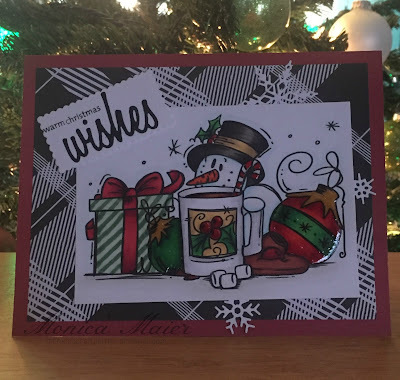 I've made 4 cards and not only do they have presents wrapped up on their sleighs, but, they also have a gift card for one of my favorite restaurants in the area. 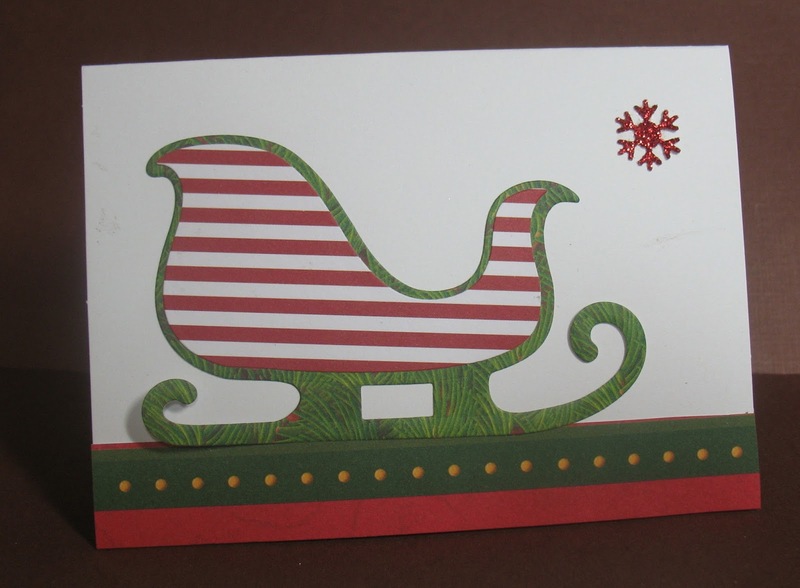 This first gift card was made for a White Elephant exchange we had and I love the easy way you can put this together. I went a bit glitzy too. Inside of card close-up without the gift card. See the present in back of the front sled rail. 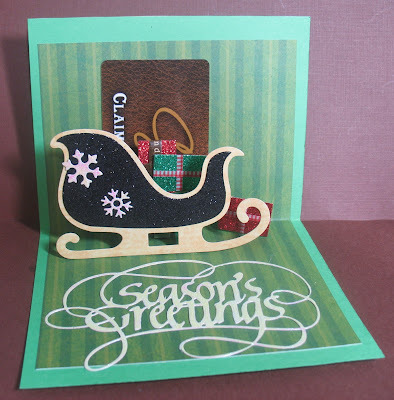 Elizabeth Craft Designs A Way with Words "Season's Greetings"
Sharing another gift card. Those snow flakes with the set are beautiful. I love the striped paper and it looks great against this ornament strewn background. 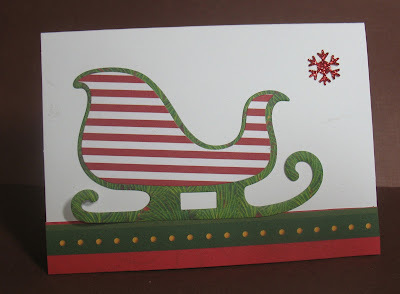 I did put a panel down from one of the Elizabeth Craft Designs dies the color of the sleigh's rails so I could write a little note. First of all, have a Merry Christmas to all. We're having a family dinner and exchanging presents; enjoying all the holiday spirit and family fun. 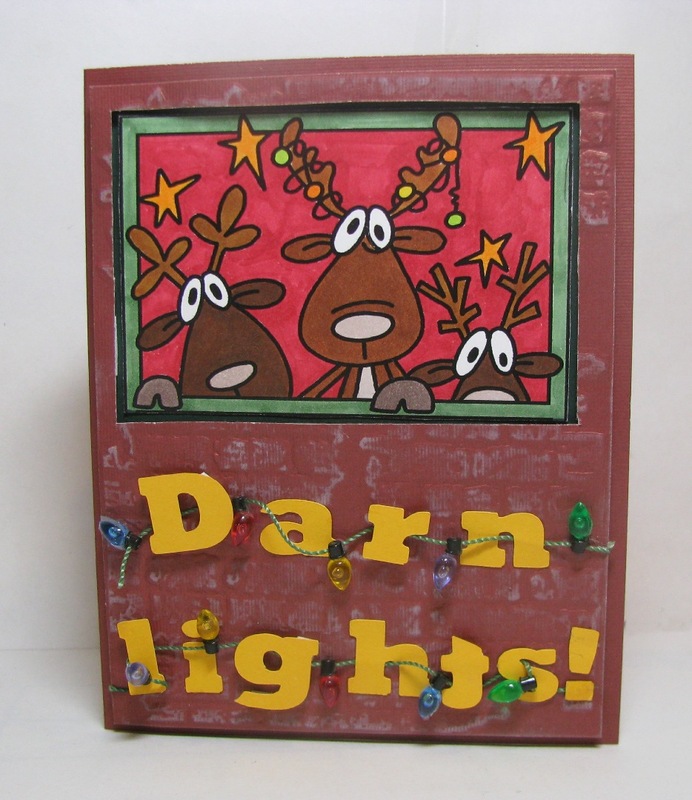 I had to find a fun card to do for you all. This great Bugaboo image just swings with attitude. I love the image and had such fun coloring this gal. I also think that if you are hanging up ornaments, then you have to have fun with it. 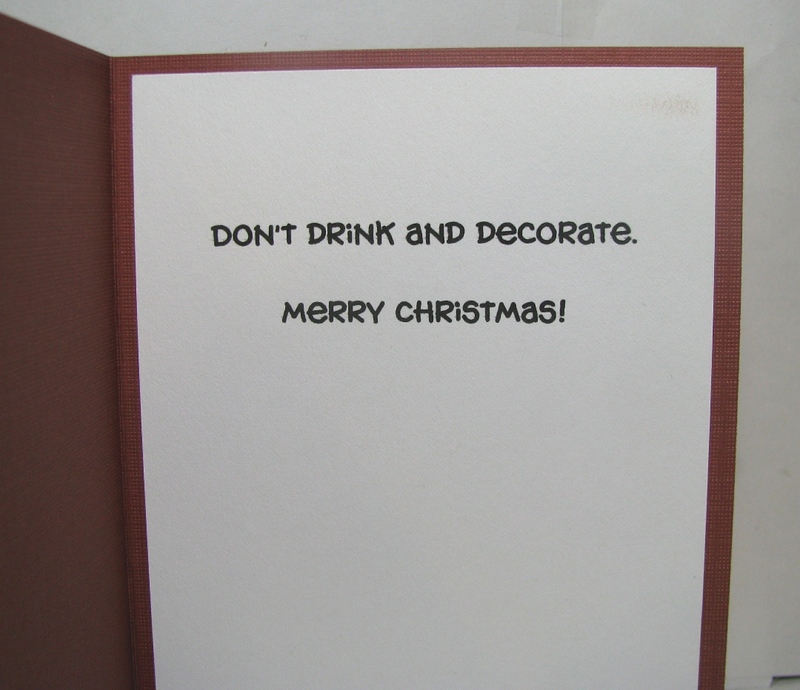 So this is my Christmas with an Attitude card. I do hope everyone has a wonderful Christmas and celebrates in your own way the holiday season. 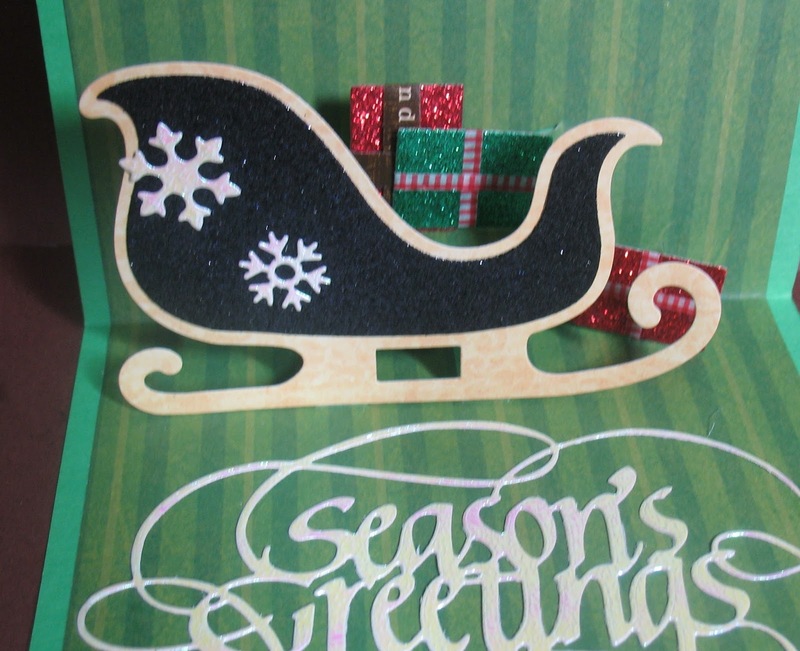 I like the versatility of die-cuts and I hope you didn't recognize the die-cut I used right away. 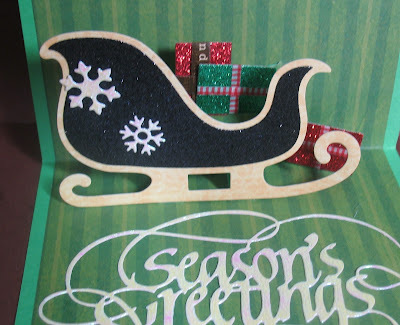 It's from the Elizabeth Craft Designs Ring Accordion die. did not use the main portions of the Ring Accordion die, but the cap that goes on the ornament. It was perfect as it's really difficult, even in real life to see where the cap stops. It's nearly time for the big man to come!!! Well Christmas has come around so quickly!! I am not prepared....I never am! I suppose it wouldn't be Christmas if I was all prepared and calm. I have embossed my background and decorated with pearls. I have die cut all my elements and printed a personalised sentiment. 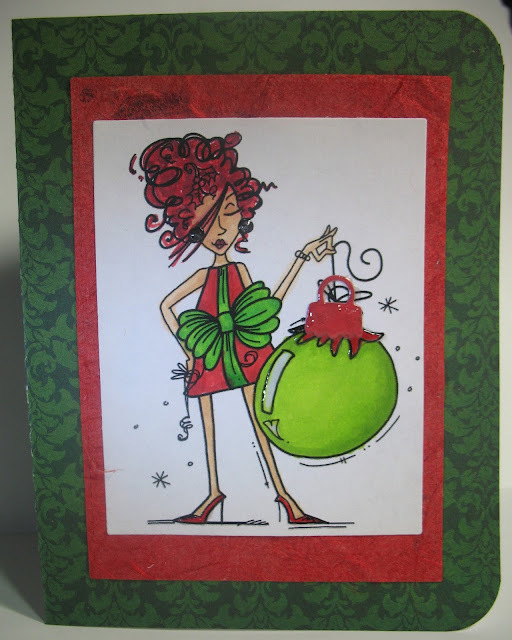 On to my card which of course is what you came by to see! I stamped the image and sentiment on some watercolor paper. Then using some distress markers and a (re used) wink of stella, I colored it in. (If you are wondering what I mean by reused wink of stella... I filled the barrel with water once the original liquid ran dry.) 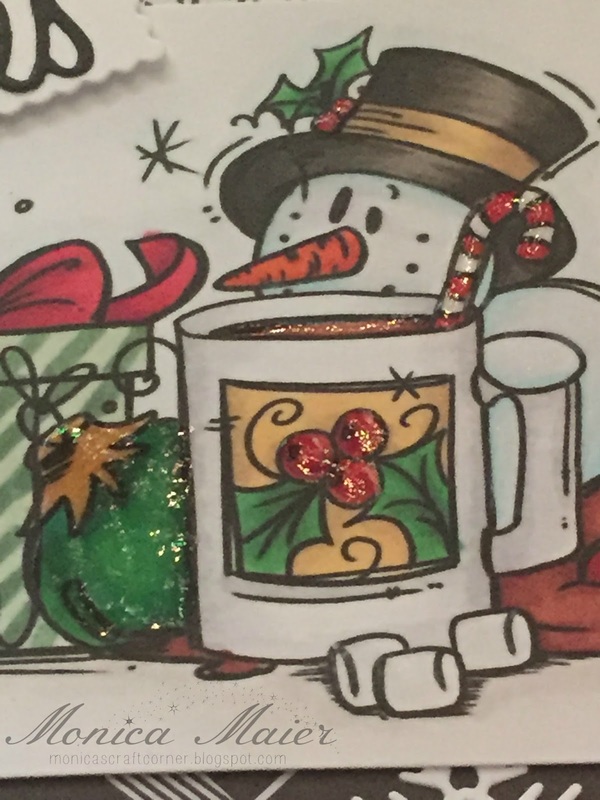 It does double duty as it leaves tons of shimmer while I watercolor the image! Which you can see better in the image below. I ran a white panel through my cuttlebug and adhered it to the card base, before adding the colored panel. 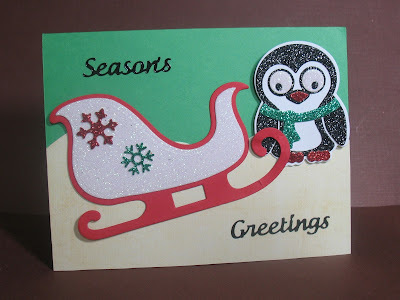 I felt it needed just a bit more sparkle so I added a few die cut glitter snowflakes. 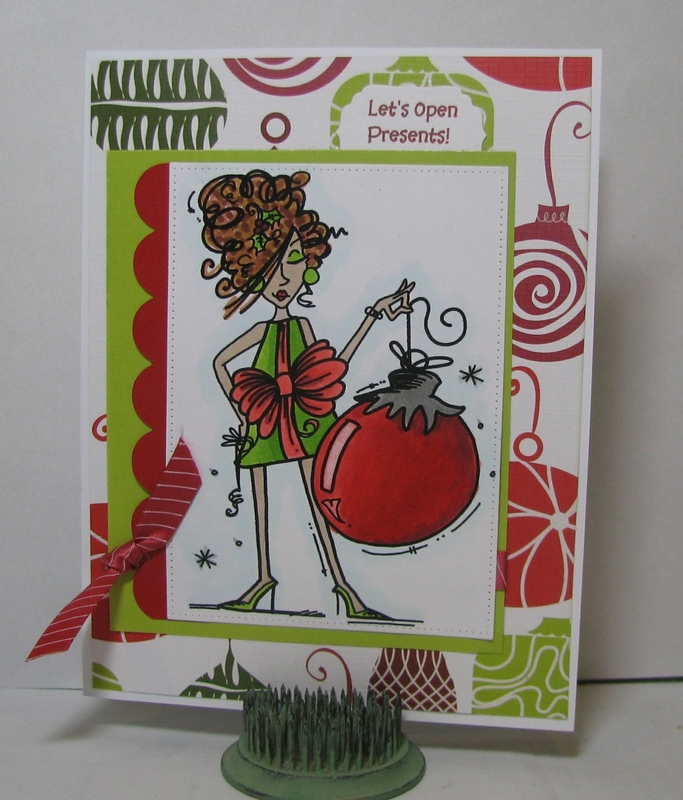 Be sure to stop by and play along with our december challenge! We would love to see what you make and you then have a chance to win one of two prizes this month!!! 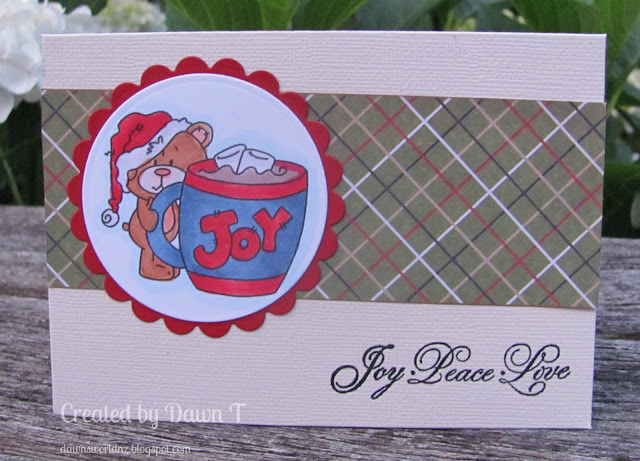 Thanks for stopping by and I wish everyone a very happy and safe holiday season!!! 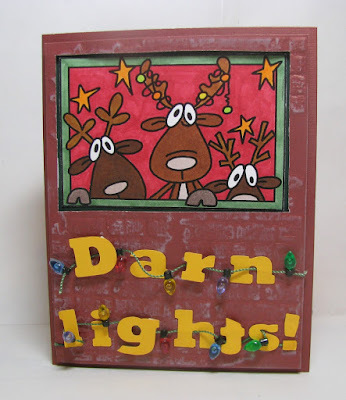 I used Bugaboo Stamps Reindeer Trio, colored with Copics. 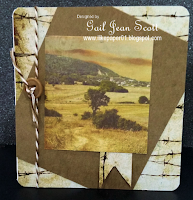 The "brick wall" is a Tim Holtz Vintage Brick embossing folder, and the lettering was cut with my Cricut. 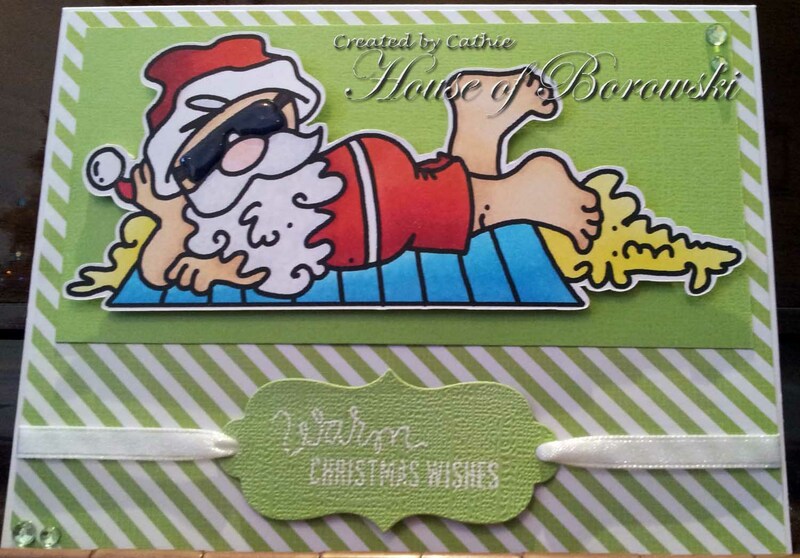 For more information on this card, visit me at Just A Nutter Paper Crafter. What better way to show you are warm and cosy but by hanging out in the sun on a warm summers day. Here in Australia that is what Christmas is all about and inspired today's card. Glossy Accents for the glasses with gems and ribbon from my stash. Loving this Bugaboo snow Family. 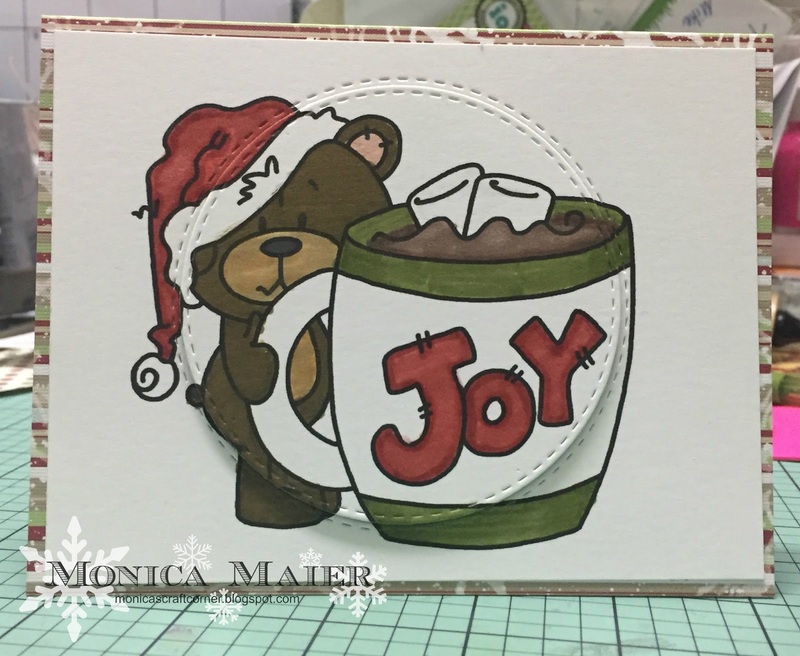 Added a Hero Arts sentiment and used a Lil'Inkers rectangle die, but our sponsor One Happy Cut, has a great supply of dies you could use. Thanks for visiting and we'd love you to play along with us this month. My first Circle Card! I've had this die cut for a year now and never used it. Shame on me! 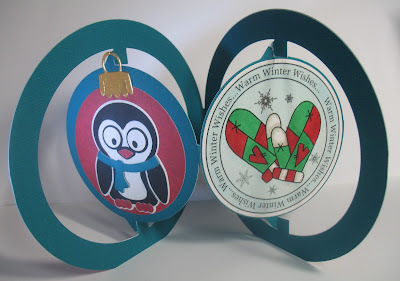 The circle die set comes with two of those ornament caps to make a circle look like it's an ornament. I LOVE THAT. 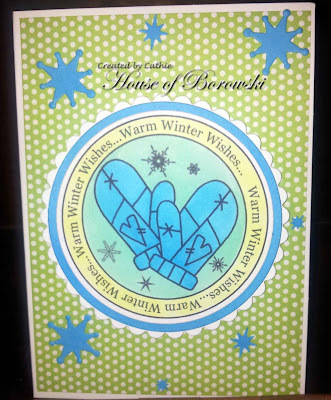 I was able to use the great Bugaboo "Warm Winter Wishes" sentiment inside to show that it may be cold outside, but warm wishes are coming your way. You don't have to make this card in threes. You can write on the back of the mittens sentiment. I cut the card in green. 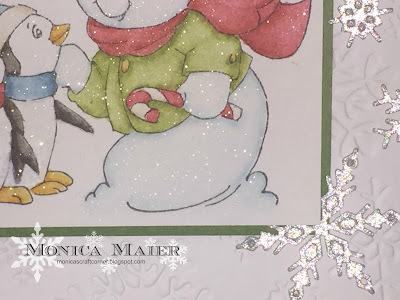 The actual color of the panel the penguin is on is NOT blue, but the same green as the rest of the card base and penguin's scarf..
To make the outer rim of the card red, all you have to do is cut the large circle again and cut off the inside portion. 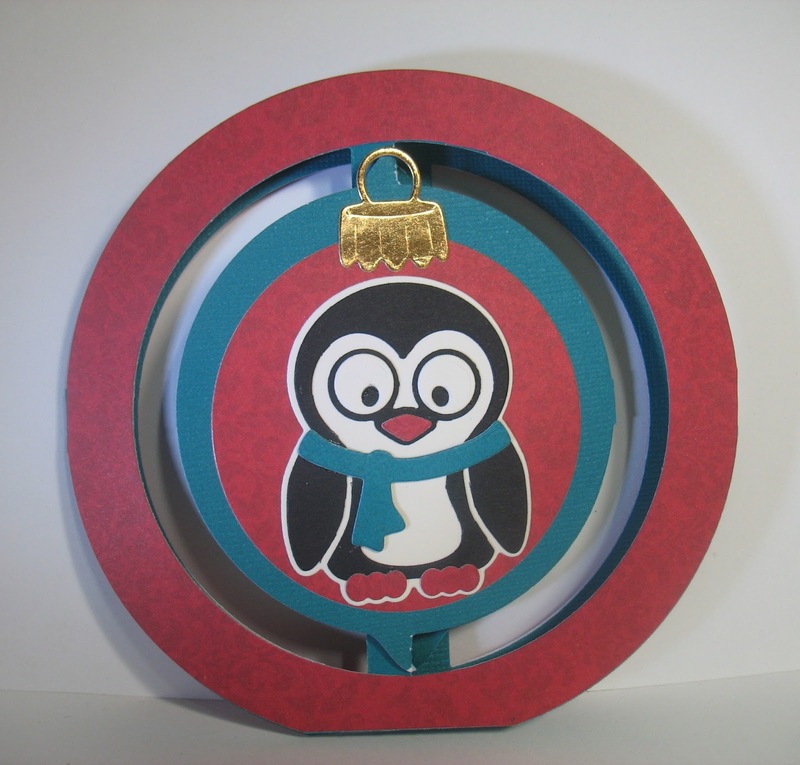 You can then use the inside to cut any smaller circles that you may need, like the one the penguin is attached to. 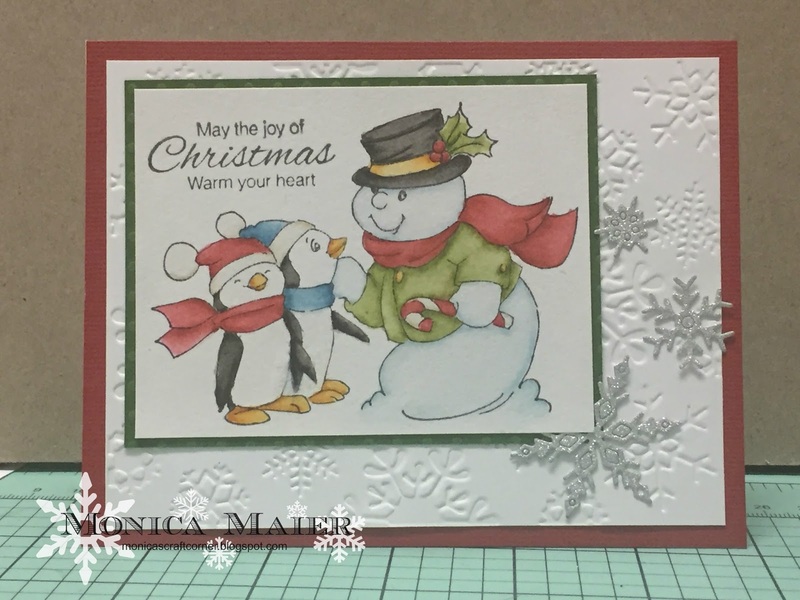 Monica here today to share a card for our December warm and cozy challenge. Our wonderful sponsors are One Happy Cut and Bugaboo digi images. I printed and colored the image using copics. 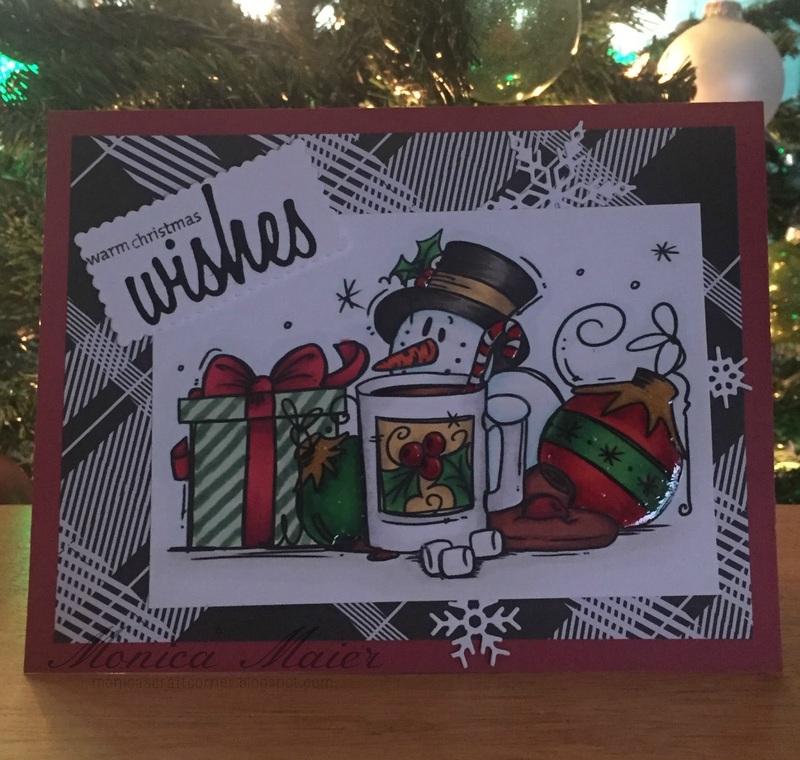 Die cut the word wishes using a Sizzix/Tim Holtz thinlet die. 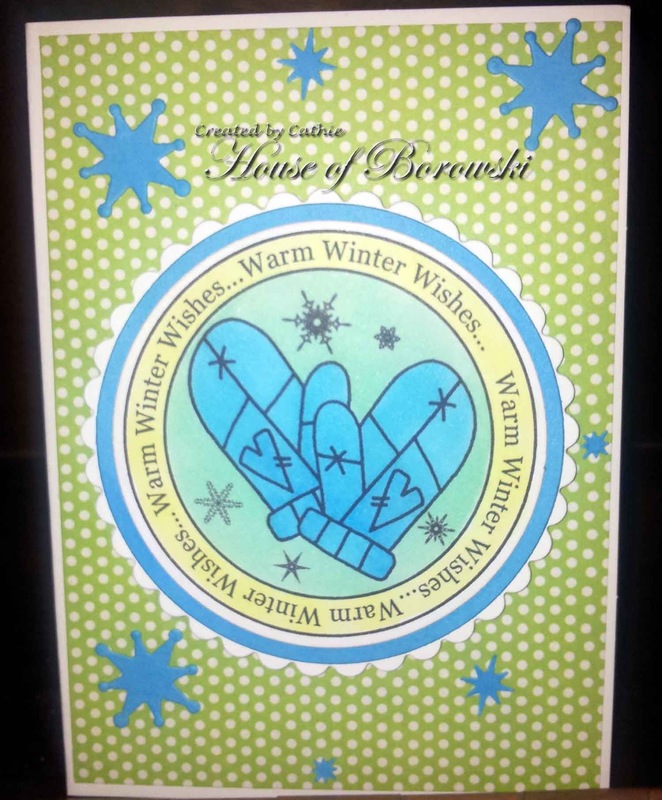 Stamped my sentiment on the die cut panel and adhered wishes. 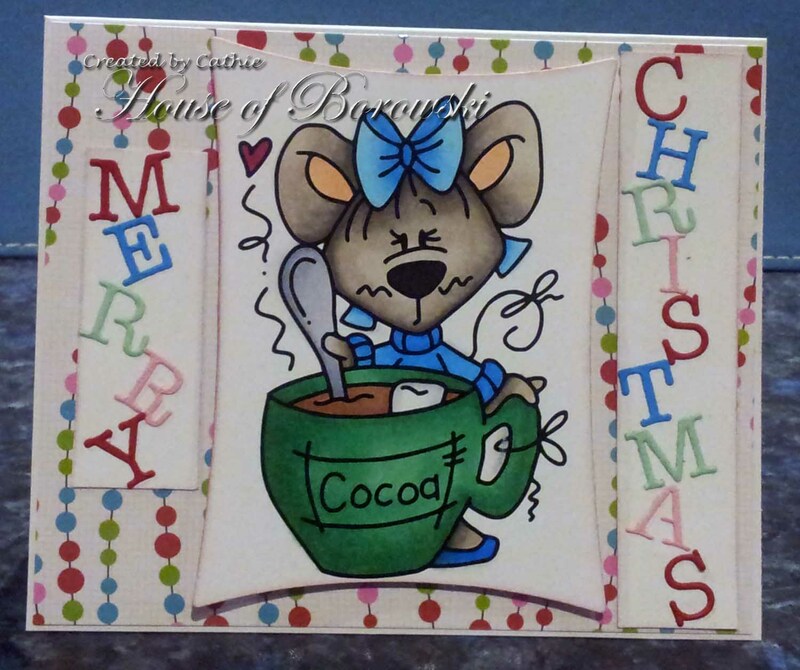 After I adhered the panels to the cardbase, I added glossy accents to the ornaments, berries and candy cane. To add an extra touch to the card I tucked a few snowflakes under the colored panel. Hope you join us here for you chance to win one of two prizes this month! We can't wait to see what you do! Hi! Today is my spotlight day, and I'd like to show you a tray insert I made for today! This is my idea of warm and cozy-lounging around on a beach with an adult beverage! Cricut- Deserted island (Formal Affair), Cloud (Artiste), Wine glass (Simply Charmed). For more information come join me at Just A Nutter Paper Crafter! We are continuing on with our warm and cosy theme this month with the fantastic sponsors of One Happy Cut and Bugaboo Digi Stamps. When I saw this image from Bugaboo I thought it was perfect for our theme, what's warmer than mittens? 3D Christmas Tree Set for the stars. Dear KT FIT KITTY, Email us atthedcdivas@gmail.com to claim your prize. 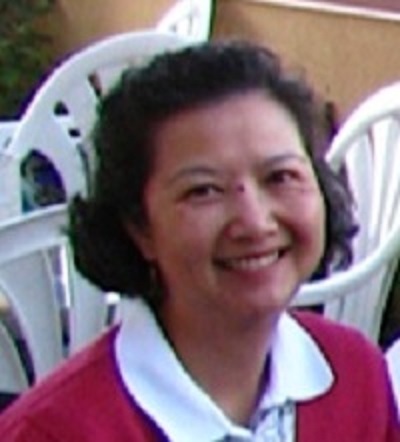 Arlene's Favorite is Gail Scott. I love the photo and brown tones she used. Michelle's Favorite is KT Fit Kitty's beautiful tag. I love the colors and the stamps she used. Are You Warm and Cozy? Let's see what the Divas have in store for you! Michelle is thinking the same thing as Arlene with her card! 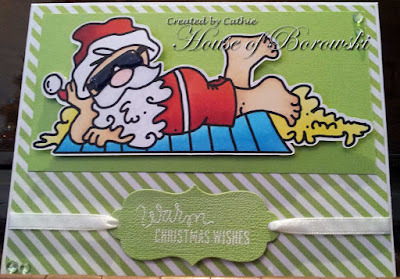 For more information, see Michelle's card at Just a Nutter Paper Crafter!